In the aftermath of the Donald Trump-Kim Jong Un summit, fewer Americans are now uneasy about possible conflict with North Korea. More feel the countries moved closer to peace than to war, though most feel it's too soon to say. More than half of Americans approve of President Trump's handling of North Korea, specifically, and his overall approval rating has inched up to 42 percent, his highest in more than a year. Although many (47 percent) say the result of the summit for the U.S. was mixed, twice as many Americans (32 percent) call it a successful than unsuccessful (15 percent). And while many don't see movement, those seeing a move toward peace (31 percent) greatly outnumber those who see the nations closer to war (6 percent). Last summer, more than seven in 10 Americans said they were uneasy about the possibility of conflict with North Korea, a figure that has been dropping and is at 49 percent today. It's largely Republicans (and independents to a lesser extent) who have become less uneasy and more confident that the North Korea situation can be resolved without conflict. More than half of Americans -- 52 percent -- approve of how the president is handling the situation with North Korea, not too different from a few weeks before the summit, but 18 points higher than the start of the year. President Trump's overall approval rating is now 42 percent, a slight uptick from last month, and his highest approval since last spring, shortly after a U.S. military strike in Syria. The president continues to get high approval ratings from those in his own party, but it's his approval rating among independents that has improved – a bump up of five points since last month -- up to 42 percent from 37 percent in early May. Still, more disapprove (51 percent) than approve. Independents do give the president positive marks on his handling of North Korea and the economy, and more Americans overall approve than disapprove of the job Trump is doing on these issues as well. It's the issue of immigration where the President gets comparatively more negative marks. A majority are skeptical that the summit will lead to North Korea ending its nuclear program. Most Republicans (54 percent), however, are optimistic. 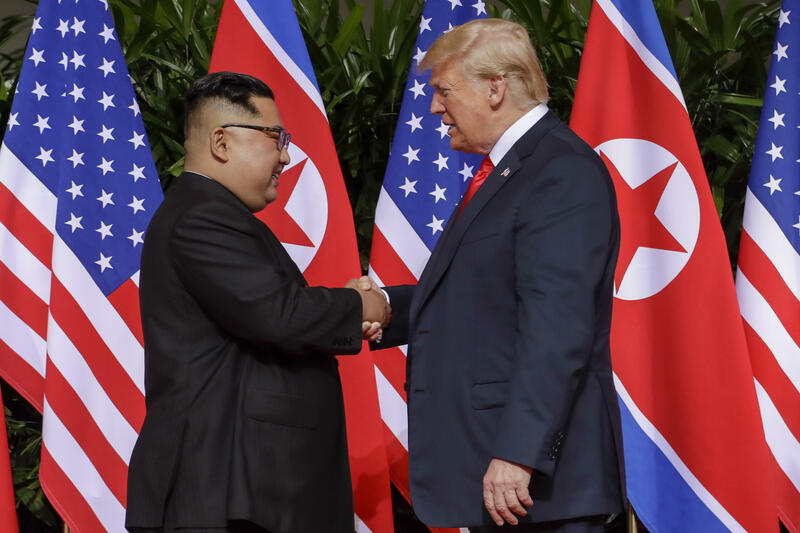 Most Republicans think President Trump and Kim Jong Un compromised equally in their summit meeting, while Democrats are inclined to think Trump compromised more. When the President praises leaders like Vladimir Putin and Kim Jong Un, most Americans see that as a negotiating tactic rather than admiration for those leaders. More generally, most think the U.S. should negotiate with dictators and authoritarian governments where they can.